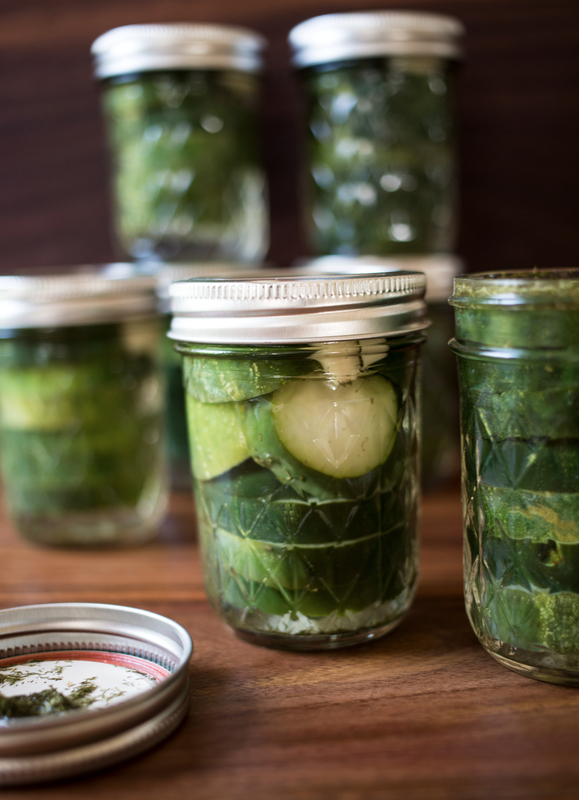 From the kitchen: The Best Pickles EVER! p.s. these guys make excellent gifts! In a large measuring cup with a pouring spout (4 cups or larger), combine vinegar, water and salt. Stir well, until salt is dissolved. Set aside. Slice cucumbers into 1/2″ thick chips (rounds). 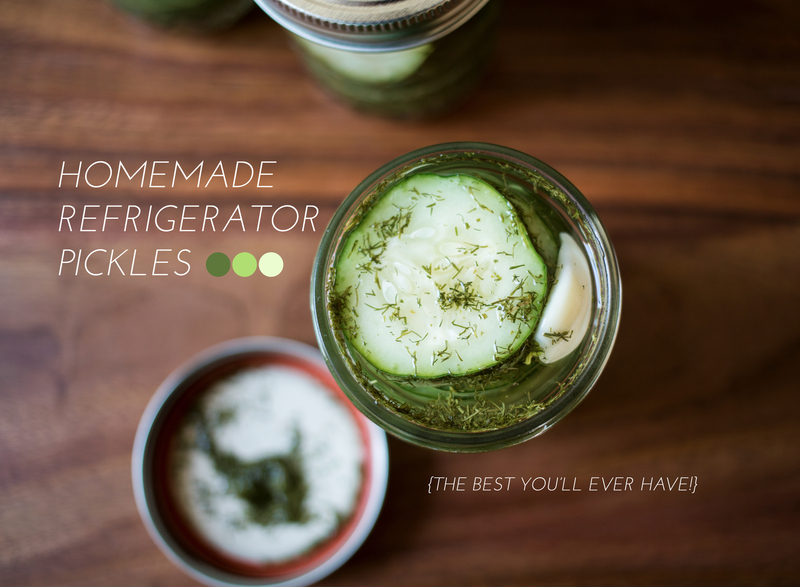 Fill jars with sliced cukes, each will hold about 1 whole cucumber. Add 1 garlic clove and 1/4 teaspoon dry dill in each jar. Top jars off with brine mixture until just full. Screw lids on tight and refrigerate for at least 1 week. These guys get better with time, we like them best after 2 weeks. Jars keep in the fridge for up to 2 months. ENJOY! Yup. I’m making these. I loooooove pickles! Pickles as wedding favors. What a great idea. You man certainly cooks “man” food, short ribs, eggs and pickles…I love it. I am going to try your recipe tomorrow. I love pickles so very much. Thanks Connie! They were a hit, I think. We still get wedding pickle requests from friends! And yes, Evan is a manly man when it comes to food– meat, potatoes, beer, bbq, and so on :) He does have a lighter side though, he grew up with a vegetarian older sister and loves a good veggie meal as well! I have so much trouble keeping my pickles crisp. I’m going to try this recipe! Thanks for sharing this! I’ve always wanted to try making pickles! Omg these sound amazing!! Thanks for sharing it!! I don’t know when he started doing this either — he certainly didn’t learn it from his Momma! And his brother’s pickles are different, too. Have you ever made these and added sliced carrots or other vegetables? My husband just canned some extra garlic dill pickles and had some that didn’t fit in the jars. I used the cucumbers he had left and made a couple jars using your recipe. Since they didn’t quite fill the jars I added some sliced carrots. Hoping for the best! Yes! We’ve used this pickling recipe for many veggies, carrots included! My son chose to make these as gifts for our family and we cannot wait to try them! I shared a picture in my Instagram page, and have had a ton of requests to share the recipe. Do you mind if I share it on my web page with a link back?